When I worked on my first book, I took the advice to “ignore the internal editor” to heart. I tried to ignore it. But, when I went back and began correcting the spelling errors I’d deliberately ignored, and adjusting the phrases that felt awkward, I realized something. I write better when I listen to my internal editor on minor aspects. Now when I read about other people’s internal editors pulling their plot to shreds, I can understand why one should ignore it. However, my internal editor gets upset over minor mistakes. Misspellings and awkward grammar are my editor’s pet peeves, not plot or character development. Listening to my internal editor means that my first real manuscript edit does not have to focus on misspelled words and grammar errors, even if I am looking for those as I read. Instead, I can focus on the awkward plot points and the threads that go nowhere. As an author, I have a fairly simple four step editing process. I realize that, as the author, I will likely be blind to some “right-spelling but wrong-word” errors, and other minor things as well. However, knowing this means that I can use my editing techniques to minimize those challenges as much as possible. My first edit is a basic edit. I read through, noting plot points and threads, and seeing how the story flows together. During this read, I correct any grammar or spelling errors that I see. Once this read through is done, I note where I need to add or remove information, and brainstorm solutions for any awkward but essential plot constructions. Then I add and remove information as necessary to fix the plot point, character arc, and other macro challenges to the story. I also make sure to change any other minor issues that are noticed. The second edit happens as I read the story out loud, either on my computer or printed out on printer paper. Printing the story out changes how my brain views the story, and enables me to see more of the potential issues. Reading the story out-loud enables me to fix awkward dialogue, sentence construction, and other flow based issues. Changing the medium, and using both visual and auditory methods mean that the brain changes how it processes the information and I can see what is actually there, not what I think is there. Then the story goes to my beta-readers. Beta readers look for any remaining macro issues, like a plot thread I missed trimming or a character that never comes back in. They will even, sometimes, not remaining spelling and grammar errors so that those get fixed. After the story comes back from the beta-readers, I do my third edit based on their suggestions, fixing the issues they noticed, and working to make the story as strong as possible. Then, as part of this edit, I adjust the formatting, spacing, and headings to create a book that can be uploaded as a manuscript. The fourth edit is the funnest edit of all because I am editing the print proof copy of the book. This edit takes the entire book into consideration, from front cover to back cover, and every page in between. Once I’ve read entirely through the print proof, I can change the manuscript and resubmit it. Then, if I feel it is necessary I can order another print proof for a fifth edit (or just to check the cover design). In all honesty, it depends on how much editing is needed. Reading a 200+ page proof copy can take half a day, to a full day. Making the changes based on that copy can take a lot less time, maybe only an hour or two depending on how extensive the changes to be made are. On average, the first edits take the longest. I am a fast reader so my just-reading and editing speed is fairly quick. However, a read-out-loud edit can take over 16 hours, spread out over several days. After all you can’t exactly talk for 16 hours straight. If you have ever edited an eight to twelve page university paper, you may have an idea of how much work goes into editing. Everything needs to feel just right, or at least as close as possible. Even with the best editing strategy possible, and even with professional editors, many books come to print with a few (or a lot) of minor errors. The most common are minor grammatical errors, he instead of her for example, or except instead of accept. Sometimes the errors can be a little comical, predictor instead of predator is one that I had to smile over as my brain took a tangent on predator predictors. Though, my favorite minor error is actually in a very well-known book. In Tolkien’s Lord of the Rings Trilogy, hidden in The Fellowship of the Ring there is one spot where Bilbo is written instead of Frodo. Now, you have to wonder how many times those books have been re-printed, edited, and everything else but that one little word was missed. Even the best books, from the best authors, can hide one or two mistakes. It is a fact of life for writers, books, and authors. Looking at the editing process, and the number of edits that can go into an indie-published book, would you consider writing and publishing your own book? 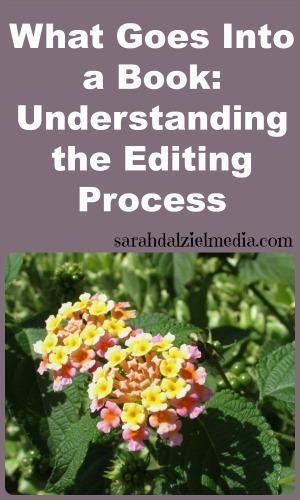 Would you use a 4 or 5 step editing process, or would you add a 6th or 7th step with a professional editor and/or a line-by-line proofreader? It IS quite a process! But I would definitely have someone (or two) to specifically proof-read. I’ve read a LOT of fan fiction and self-published books–and written enough grad-level papers to have become a few books. Some are fabulous, some really weren’t ready. A proofreader who’s reading fresh is a must, and yes, even then, it’s quite possible to have simple errors remaining, but they’ll be rare.